I adore this top. Until I put it on. Something about it doesn’t work with my body shape. I think it’s just that little bit too short so it makes me look like my waist is higher than it is, which I know sounds like it could be a good thing, but what actually happens is that it makes my hips look like they start higher up too, and that they are a few inches wider than they really are. None of this pleases me. 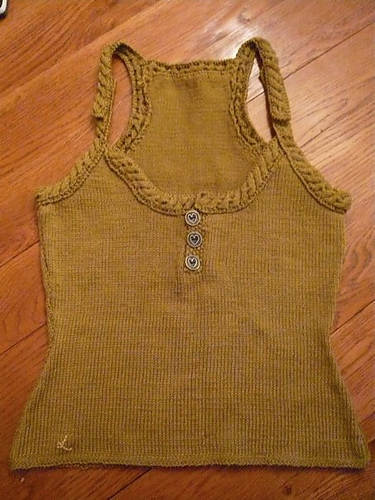 I do, however, like to look at this top from time to time and contemplate having the time to make another one that fits. It was my first ever non-scarf knitting project so I should be proud I suppose. I even got quite carried away with myself and embroidered a little ‘L’ for my name it.